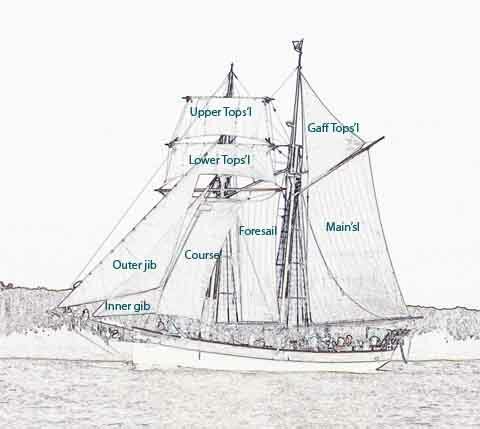 The ship has a full sail wardrobe of 8 sails, not shown on this image is the Flying gib or Storm gib which is a small gib used in heavy weather. Most of them are made out of Oceania canvas but on the odd occasion we have had to source Dacron instead. Our preference is for canvas as that is more in keeping with the tradition of the vessel. Below is the layout of the ship above and below decks. Below decks there are two double cabins, the Master’s cabin(aft) and the Owner’s cabin (for’ard).